Is there a better alternative to Delicious Recipes? Is Delicious Recipes really the best app in Cooking category? Will Delicious Recipes work good on macOS 10.13.4? Delicious Recipes lets you collect your recipes, and have them all in one convenient place. Tame your paper chaos and unsorted bookmarks. Sort your recipes and retrieve them easily. Thanks to the intuitive interface, you will succeed in the twinkling of an eye. Easy to Use - Your recipes are the most important thing. The simple and yet powerful interface is a result of this steady mindset. All functions are self-explanatory and easily reachable. You can use keyboard shortcuts that are available for all main functions, if you want to be even more effective. Delicious Recipes needs a review. Be the first to review this app and get the discussion started! Delicious Recipes needs a rating. Be the first to rate this app and get the discussion started! Fastest Entry. Ever. - Forget about clunky tables with ingredients and directions. Start a new way of managing your recipes. Use copy-and-paste or write everything down in one go. We've set up the most important things for you like cuisine, yield and time. You can either use them or add your own properties. Just spend more time cooking. Customize Every Recipe - Emphasize important steps, make them smaller or bigger. Change your font, underline essential instructions. Customize every recipe and be The Chef in your kitchen. 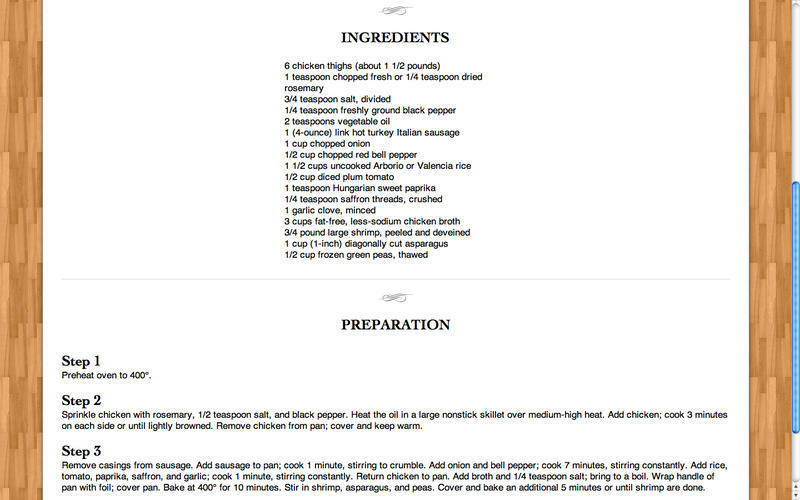 Full Screen Cook View - You see the most important parts of your recipe with just one click. The gorgeous full screen cook view helps you to focus. Use it on your laptop in the kitchen, or increase the font size and use it on the computer next door. Melt Your Friends' Mouths - Send emails with an outstanding template to your friends and family. Pamper their palate with your culinary masterpieces. 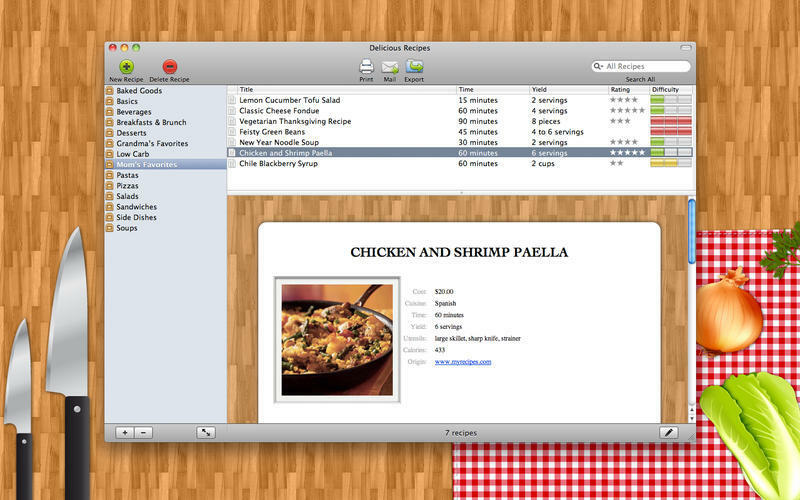 Take-Away Deliciousness - Use the optimized print functionality to put your recipes on paper. 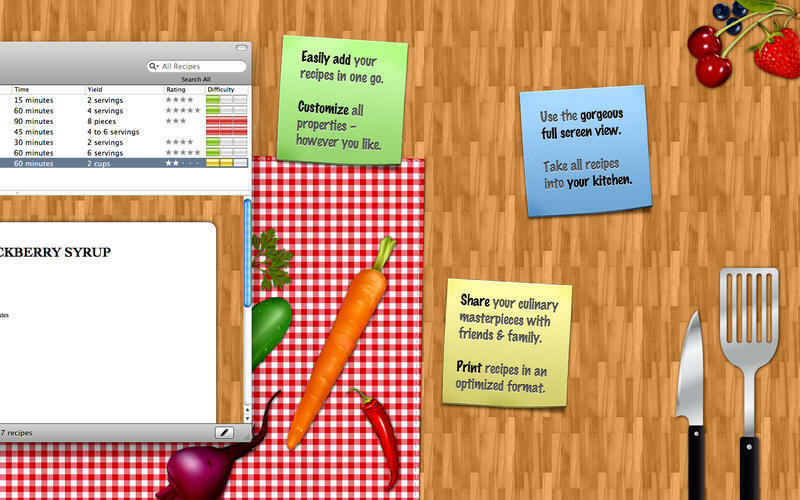 The printer-friendly template assists you on the go and in your kitchen. Intuitive Drag-and-Drop - Add pictures with easy drag-and-drop. Drag them from folders or directly from the internet. It's your choice. 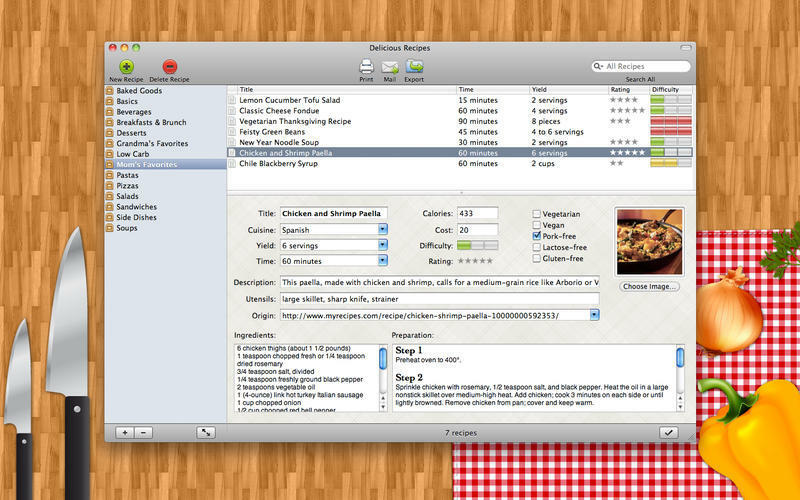 Smart Search - Use the iTunes-like search to find your recipes. You can either search everything or make your search more specific. Whether cuisine, description, utensils, ingredients, origin, time, title or yield - it's very fast to retrieve your recipes. Spelling and Grammar - Crème brûlée, Pâte Brisée, or Khoresht - e - ghormeh sabzi? The integrated Mac OS X spelling and grammar functionality helps you whenever possible. Auto-Save Included - We save your recipes every 2 minutes, so you don't have to think about it. Compatibility and Fast Export - We don't like it if you feel locked in. That's the reason why we save your database in a standard-based SQLite format and let you export all of your entries in the two most compatible formats. Use the wonderful HTML export and upload your recipes to the internet. Or export your recipes with pictures to an optimized RTFD format. Thanks to our printing support you can also save your recipes as PDF files.